Our program provides the latest wound care treatments, as well as the experienced care of a team of physicians and nurses who specialize in wound care management. In addition, the Hyperbaric and Wound Care Program offers care in a quiet, suburban setting, far from the noise and congestion of central Las Vegas. Hyperbaric Oxygen Therapy (HBOT) is a procedure in which a patient breathes 100 percent oxygen at pressures two to three times greater than the atmospheric pressure at sea level. This dissolves more oxygen in the bloodstream, which delivers it to every part of the body. Hyperbaric oxygen can be delivered in hyperbaric chambers made of clear acrylic and filled with 100 percent oxygen. Hyperbaric oxygen treatments are normally painless and the average session is about two hours. During your treatment you can listen to music, watch TV, or take a nap in the chamber. Treatments are scheduled daily, Monday through Friday. Hyperbaric oxygen can be applied as a primary or secondary treatment for many conditions including bone infection that does not respond to standard treatment, crush injuries and reattachment of severed limbs, deep tissue injury from radiation therapy and skin grafts or flaps that are not healing. The air we breathe every day is made of 21 percent oxygen, 78 percent nitrogen and other gasses at an air pressure of approximately 14.7 pounds per square inch. 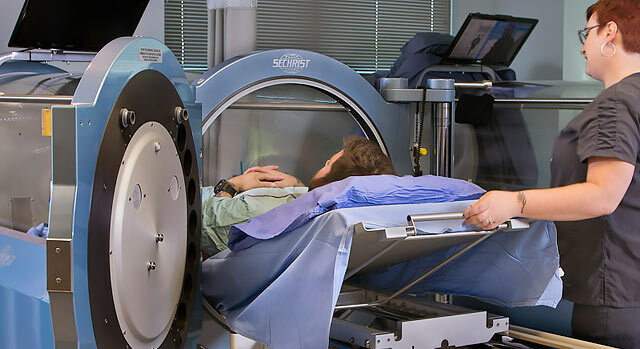 While the primary goal of hyperbaric oxygen therapy is to help heal wounds, each patient may have different goals regarding his or her outcome. For example, some people may have hyperbaric oxygen therapy to help reduce infection or decrease extensive swelling. Others may use HBOT to help prevent further deterioration of existing tissue. Not all patients respond to HBOT the same way, so it is difficult to predict outcomes with certainty. Hyperbaric oxygen therapy works from the inside of the body out, so improvement in the patient's condition may not be immediately visible. Patients are typically re-evaluated during the course of treatment to determine if the maximum benefits of HBOT are being achieved. The staff at the Hyperbaric and Wound Care Program is made up of certified hyperbaric technologists and specially trained physicians and nurses. All have attended formal courses and have met or exceeded standards for all areas of hyperbaric medicine. For more information about inpatient or outpatient wound care, please call 702-233-7979.